The West Strand, or Mill Strand, starts at South Pier Portrush Harbour and stretches to the black rocks at West Strand Road, heading out of town towards Portstewart. Having this gorgeous beach so close to all the town action is truly a benefit giving a great holiday feel all year long. 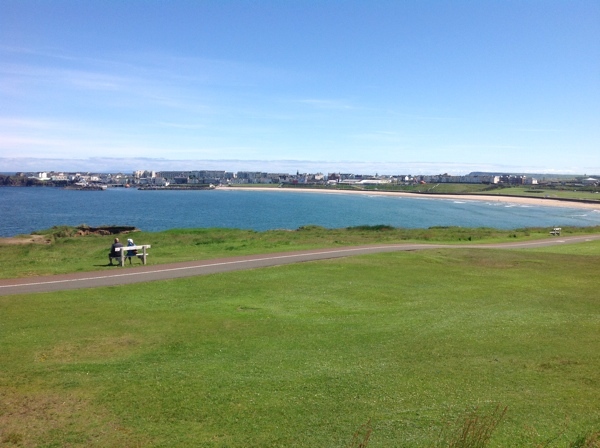 Portrush West Strand is a classically arching, Blue Flag beach so it's clean, safe and beautiful! You can find a Life a Guard every day from 11am until 7pm between the end of June and the start of September. This is a perfect beach for swimming, surfing, paddle boarding, kite surfing, wind surfing, diving and well as for walking, horse riding, jogging, cycling, playing, paddling or purely relaxing! Walk or cycle along the Promenade or dip your toes in the sand and water along the shoreline. There is parkland, paving and views of the great sea-front houses on one side and the Atlantic Ocean on the other. The Promenade is a raised walkway alongside the beach. There are several sets of stairs down to the sand. Walking past Barry's Amusements is always exciting, as you know what fun is being had inside and you can frequently hear the high pitched squeals to match! After Barry's you'll turn up at the landscaped parkland of the West Strand at Eglinton Street, accessible by car, under the railway bridge off the A2 (Portstewart Road). There is a large car park with ample parking and toilets at the bridge end. There is disabled access to the beach promenade. This is a great grassy area to run with children or your dog, summer dog restrictions apply at Portrush West Strand. This is the perfect place for a 'park up and read', immerse yourself in a great book with an ocean view! The location and beauty of the West Strand make it very popular, especially in the hot summer months, when people move between the beach and other fun activities they can choose at 'The Port.' This beach can be vibrant and fun filled during the day or relaxed and peaceful at sunset.